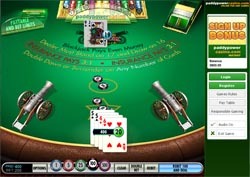 In Double Attack Blackjack, the dealer will stand on all 17s. You may split, but note that split aces only receive one card, and if a 10 is played on split aces, it only counts as 21. Doubling down is allowed on any two cards after dealer checks for blackjack (except for split aces). You may surrender, even after doubling down. Insurance bets are also available. Chips come in five denominations in Double Attack Blackjack: 1, 5, 25, 100, and 500. The minimum bet allowed is €/£1, and the max bet per hand is €/£1000. Payouts are as follows: blackjack pays 1:1, insurance pays 3:1, and standard wins pay even money at 1:1. If you tie with the dealer, all bets push. Double Attack Blackjack looks great! It might not be the most realistic blackjack game ever made, but considering the fact that it comes in instant play format, the graphics are quite good. Card movements are subtly animated, and if you win a hand after you have used the special Double Attack bet, a pair of cannons blast holes in the dealer’s cards! It’s little effects like those that make WagerWorks blackjack games so much fun to play. Because this game allows you to double your bet after seeing the dealer’s up card, Blackjack only pays 1:1, the same as a standard win. Your strategy must therefore be different in this game – you will be focusing on any win rather than just a blackjack win. Also, remember that if you choose to place a Double Attack bet, then later in that hand, splitting and doubling down will cost more. Our favorite part about Double Attack Blackjack is the fresh twist it puts on this classic game. The new rule, and the fact that blackjack wins only pay out a 1:1, make the strategy for this game very different. If you rely on tables for your bets, you might want to play this one free for a while, because it takes some sideways thinking to work things out – but that’s the fun of it!